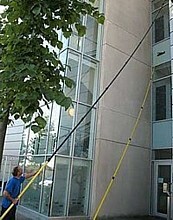 At Dalemarsh we use the latest pole cleaning equipment to access and clean windows. 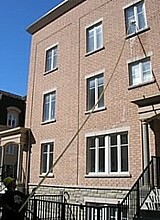 We use the Omnipole reach and wash system to clean residential and commercial buildings. The Omnipole system converts tap water into pure water by way of a state of the art reverse osmosis system, this purified water is then pumped up a specially designed pole ( up to 20 meters / seven floors ) and on to a brush to clean the windows. As there are no impurities left in the water no marks are left on the glass when it dries. 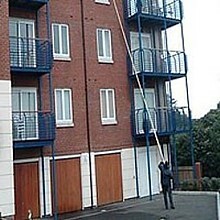 All this takes place with the contractor's feet safely on the ground alleviating any health and safety concerns. Please see the images below of the system in operation.